According to an interview with T J Gandy in 1921 the first playing strip comprised of Blue jerseys, White shorts (known as “knicks”) Red socks and Red caps. As a result of T J Gandy’s influence the strip changed to Blue and Black although the Club badge still contains Red. At a Management Committee Meeting on 18th June 1909, notice was given of an Annual General Meeting resolution that the Club colours be changed from White to Blue, Black and White. The resolution was carried at the Annual General Meeting on 12th July 1909. There is also a thin thread of the Bath Club Tie history running through extracts from Management Committee Minutes. 13/1/58 Mr. Holmes told the meeting of the large number of Club ties in hand and the following resolution by Mr. Foster seconded by Mr. Bascombe was carried. “In future Club ties to be issued to all players and committee members past and present – subject to each application being authorised by the Management Committee”. The Bath Club Rules were recorded in1893. Rule 14 stated that “no member be allowed to wear the Club Cap unless selected to play in not less than 6 matches during one season”. 9/1/56 Agreed on the proposition of Mr. Burrough, seconded by Mr. Carey that the rule re the qualification for club ties be adhered to. 22/7/57 The Chairman reported that a certain Vice President of the Club had asked permission to wear the Club tie and that the privilege be extended to all Vice Presidents with three year’s service. On the proposition of Mr D M Smith seconded by Mr H J Simpkins it was agreed not to extend this privilege. 13/1/58 219 Mr. Holmes told the meeting of the large number of Club ties in hand and the following resolution by Mr. Foster seconded by Mr. Bascombe was carried. In future Club ties to be issued to all players and committee members past and present – subject to each application being authorised by the Management Committee. At a Committee Meeting on 21st April 1893 it was resolved that “all members of the 1st XV wear the City Arms on their Jersey and Blazers, any member who has played in not less than six 1st XV matches being eligible to wear the badge, but a written order from Hon Secretary to procure it. Also that a Club Blazer be selected by a Sub Committee. At the July 1914 AGM, Mr. Vincent Coates suggested awarding of blazers in order to improve the Club image and raise player morale. The main concern was that players were sometimes reluctant to play in Away games. Coate’s suggestion was that the badges be presented to players appearing for three-quarters of the season’s 1st XV games – three-quarters of which should be Away games! Caps would continue as before, but additionally, a 2nd XV Cap to be made available, using the same criteria of three-quarters of 2nd XV “out” games. At a Management meeting on 20th March 1923 it was resolved that blazers be presented to players who play 75% of the away matches in two seasons, starting with next season. 22/3/48 The Hon Sec referred to a letter received from the Cornish Choughs Inn Penzance asking for a Bath Club badge. Mr. Slade made several enquiries regarding the possibility of badges or blazers or caps as an award to the players on making so many appearances for the Club. The matter was left on the table. 12/7/48 The Hon Sec agreed to make enquiries on club ties. 27/7/48 The question of a Club Badge for blazers was raised by Mr.Weiss but this was left until more was known about club ties. Prior to the latest hand woven badge, a larger (3” x 5”) cloth version was favoured. 12/12/49 On the proposition of Mr. Slade, seconded by Mr Arnold, it was agreed that the club badges to be given for a specific number of games played for the 1st XV. Further agreed on the proposition of Mr. Cutler seconded by Anderson that the specific number of games be 15 in one season or 20 in all to start from the beginning of season 1949-50. 27/3/50 On the proposition of Mr. Simpkins sec. by Mr. Davies it was agreed to ask Mrs. Gerrard to design the club’s blazer badge. 17/4/50 Mrs. Gerrard having presented designs for the blazer badges it was decided to use the one she had marked Scheme B. 9/8/50 Applications to purchase badges were received from Messrs Vassiere and Weiss and the Hon.Sec. was asked to look up their records. 28/8/1950 On the proposition of Mr. Slade sec by Mr. Crane was agreed that Mr Weiss be allowed to buy a club badge. Further agreed that Mr. Vassiere be asked to wait until he qualifies for a badge by playing 5 more games for the 1st XV. 4/9/50 It was agreed that 3 undated club badges be obtained one each for Messrs Arnold, Halse and Ball and that applications to purchase badges be considered at the first meeting in each month. 1949-50 season end – In Hon. Sec. note book: Badges to 11 players listed for that season plus, Ball, Halse, Arnold and Weiss. 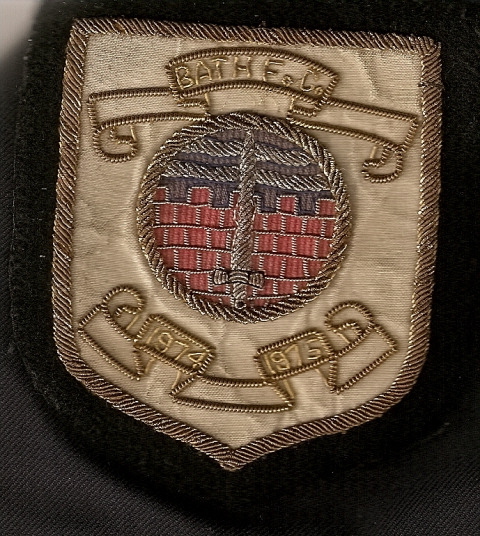 1/1/51 The Chairman agreed to attend the ground on Tuesday evening to present blazer badges. 2/4/51 It was agreed to ask Mrs. Gerrard to design and submit samples and prices for club badges. 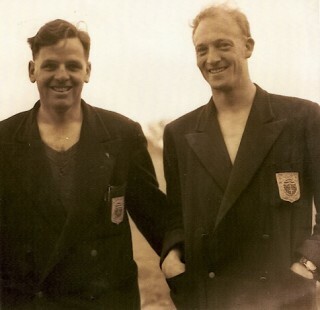 20/8/51 It was decided that players who had qualified for a badge during 1950-51 be notified through a notice in the dressing room and that in future any old players who had played the requisite number of games for the 1st XV may make application to purchase one. In Hon. Sec. note book 1950-51, badges to Todd, Mattingley, Vassiere, Sheppard and Fred Hill. 27/8/51 Applications to purchase club badges were received from P A Curtis and B C Barber. 10/9/51 On the proposition of Mr. Anderson sec. by Mr.Cutler it was decided to adopt the square sided badge, a sample of which was shown by Mrs. Gerrard. 17/3/52 On the proposition of Mr Slade seconded by Mr Arnold it was agreed that the badges be presented at the Annual General Meeting and that the players be asked to return the old ones. 21/7/52 The following were appointed to go into the question of badges: Messrs. Anderson, Slade and Simpkins. 1952-53, 1953-54, 1954-55, 1955-56, 1956-57, 1957-58, No badge entry in Team Sec. note book, but badges certainly issued during this period. 10/10/55 At the suggestion of Mr. J Bailey, it was agreed that the Chairman, Vice Chairman and Hon. Sec. explore the possibility of having a blazer badge for club members. 24/10/55 It was decided to adopt the blazer badge as submitted by Smart Wear. The qualification to acquire one at own cost to be 60 games for the club, or 3 year’s service on committee. 28/6/57 The President presented blazer badges to the following players who had qualified: F.Book, P.Dart, J.Dolman, I.Balding, F.Harrison, D.Silk, I.Smart, T.Stones, J.Wood. 5/7/57 Mr. E.F.Simpkins said he thought the method of awarding Blazer Badges should be reviewed, suggesting that considerably more games should be played in order to qualify. It was agreed to leave the matter until the next meeting. 22/7/57 It was generally agreed that the rule as to qualification for 1st XV Blazer Badges needed some revision. Mr. B C Barber proposed and Mr J Arnold seconded the following resolution which was carried: Qualification for Blazer Badges in future to be 75% of the 1st XV games in one season, or 40 1st XV games in two seasons or 50 1st XV games in three seasons. County or Representative games to count. 1964-65 Margretts, Martland, Buckle and Parsons. 1965-66 Galley, Gay and Jenkins.